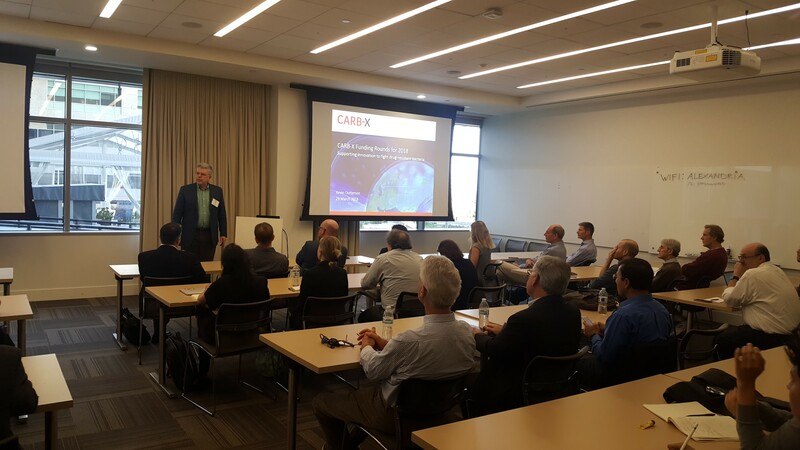 CLSI hosted a CARB-X Information Session with Kevin Outterson, Executive Director of CARB-X, on Thursday March 29, in Mission Bay San Francisco. The purpose of the event was to bring together the antimicrobial resistance (AMR) community in the Bay Area, provide information about the CARB-X process and what’s in scope for the 2018 funding rounds, and highlight the the range of support available to CARB-X companies through CARB-X accelerators. Seventy people were in attendance, including life science executives, pre-formation companies, expert advisors and investors from the Bay Area and as far as New Jersey, Seattle, and San Diego. Kevin Outterson provided an overview of CARB-X progress since launch: awards to a total of 28 projects in 7 countries of up to $74 million with the potential for an additional $89 million if milestones are met. Professor Outterson noted that CARB-X seeks to fund “high risk, high reward” AMR products in early development. In less than two years, CARB-X has become the world’s largest and most scientifically diverse portfolio of early development antibacterial products to respond to the threat of the most serious drug-resistant bacteria. Professor Outterson explained that the 2018 scope for applications reflect the most urgent needs and that they will continue to evolve along with global AMR landscape as CARB-X continues to build the portfolio. Heather Shane, Executive Director of the CARB-X accelerator at CLSI, provided an overview of CLSI’s role in providing access for companies to subject matter experts, academic research institutions, funding sources, downstream partners and many others in the life science ecosystem. A key tenet of the successful FAST accelerator upon which CLSI’s support to CARB-X portfolio companies is modeled, Ms. Shane provided real examples of how the CLSI network has helped CARB-X portfolio companies and pre-X companies (future CARB-X prospects) overcome obstacles, connect to resources and gain valued advisory support. Thanks to event sponsor Vir Biotechnology, CLSI will host another CARB-X Information and Networking Session on May 3 in San Diego, where a large cluster of AMR companies and researchers are located.